MACOMB, IL - A literary magazine for veterans affiliated with Western Illinois University, which as founded last year, will continue under a new name, "SITREP: Veteran Perspectives on Combat and Peace." The project's advisors, Barbara Harroun and Jacque Wilson-Jordan, both assistant professors in the WIU Department of English, were inspired to create the magazine after years of working with student veterans in their composition and creative writing classes. WIU, with an enrollment of 800 veterans, is nationally known as a military friendly institution. Moved by the power of their students' stories, Harroun and Wilson-Jordan believed their work should be celebrated and shared beyond the classroom. At the same time, they saw the need to foster a greater cultural awareness of the experiences of veterans. With the early support of Kathy Meyers, assistant director of the Veterans Resource Center, the project began to gain ground when student veterans from the WIU Department of English, Ryan Bronaugh, Daniel Holst and Jared Worley, joined the project as editors of fiction, poetry and non-fiction. The first magazine featured 14 contributors who represented all the major branches of the service and served in Vietnam, Iraq, Kuwait, Afghanistan and many other locations, stateside and overseas. The contributors also worked in a number of capacities, including infantryman, builder, mortarman, chaplain, pilot, corpsman, mechanic, platoon leader, radio operator and pilot. The May 11, 2015 launch of "Veterans' Voices: Stories of Combat and Peace" drew supporters from the University, as well as the larger Macomb and area communities, who gathered to hear five contributors read their work. Over the last year, the publication has advocated for WIU veterans, and finding a place on the page for their experiences within the campus and local communities. In the past year, small groups of advisors, editors and contributors have presented at a variety of venues, including the local Rotary Club, the Dealing With Differences Institute Conference at WIU, the Unitarian Universalist Fellowship of Macomb and the Macomb Women's Club. Katherine Meloan, a 1975 graduate of WIU and a Vietnam veteran, joined the magazine's two advisors for a presentation given by Wilson-Jordan at The Conference on Community Writing in Boulder, CO, in October. The editorial team is now calling for contributions for a second edition. Last year's editors will continue in their positions and be joined by Luke Cummings, a newly appointed art editor who is enrolled at the WIU-Quad Cities campus. Editors Bronaugh and Worley are teaming with Richard Chamberlain, director of the Center for the Application of Information Technologies (CAIT) at WIU, to build a website. To create a web presence, the team is rebranding with the new title "SITREP: Veteran Perspectives on Combat and Peace." Bronaugh, who came up with the title, said, "though it stands for the Commander's Situation Report, SITREP became a term we used to describe, or inquire on, an individual's situation (mentally, physically, emotionally, contextually and so forth)." At the end of February, Bronaugh will travel to Washington D.C. to participate in an award ceremony to honor a close friend and comrade and he hopes to get a copy of the magazine into the hands of President Barack Obama. "SITREP is a great collaboration between the veteran students, faculty, staff and alumni of WIU, the WIU Department of English and the Veterans Resource Center," said Worley. "I think it's very important for veterans to be heard so the civilian population can better understand. More importantly, the writing our veterans do provides an avenue for closure, as well as the opportunity to meet other veterans. As the nonfiction editor, I am consistently humbled by their stories, and cannot imagine a greater venture to be a part of than this great magazine." 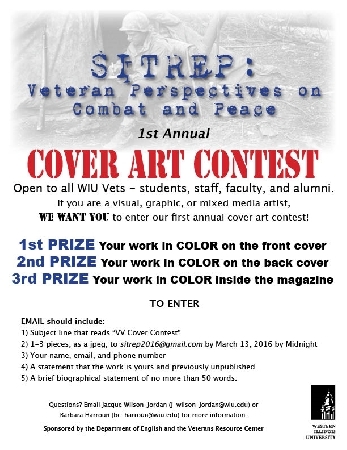 SITREP is now seeking submissions of photography poetry, fiction, non-fiction, mixed genre and visual art from members of the WIU veteran and service-member communities. Word documents and jpegs may be sent to SITREP2016@gmail.com. Editors request contributors include the submission's genre in the subject line. For additional information, contact Wilson-Jordan at j-wilson-jordan@wiu.edu or Harroun at bc-harroun@wiu.edu.